My provincial curriculum scatters trigonometry throughout several high school courses. Right-angled trig appears first as an isolated experience at the Grade 10 level. From there, the two pathways in Grade 11 cover the Sine and Cosine laws, but only one stream (Pre-calculus) continues into the idea of the unit circle and eventually the connections between the side ratios of right-angled triangles, the unit circle, the wave functions, and trigonometric identities. Since trig is doled out in piecemeal portions each semester, I often find that the hidden beauty of trig is masked by things like SOH CAH TOA. (Or, if you dare to place special triangles on the unit circle, SYR CXR TYX 1). That is, the strong message provided through our staccato complexification of methods (from SOH CAH TOA, to Sine Law, to the Unit Circle) is, “Triangles exist. Here are 20. Please find all sides and angles.” Every triangle is constructed (more often that not, constructed to scale) and the students are asked to apply laws. In short, students encounter many triangle problems, but never any problems with the triangles. It is no wonder that we lose track of some of the mysterious properties that allow for triangles to actually exist. This might help explain why my students have notoriously struggled with the concept of the ambiguous case of the Sine Law. Until that moment, students have never encountered a “fake” triangle. There was never any issue with the information provided to work with. A teacher might choose to tell students about these wrinkles and then work with how to identify and work with such cases (perhaps with interactive media such as this GeoGebra simulation or this series of Ambiguous Case Vines I built years ago). To be clear, I do believe that this work is important, but I feel that this work should arise from a need–an inconvenience that requires a new type of trigonometric proficiency2. With an eye to occasioning an inconvenience (the ambiguous case), I gave student groups a series of three tasks. None of them contained any hint that some group might create something impossible, but each of them put them in the role of creator. That way, I distanced ourselves from the notion of “ready-made” triangles and opened up (still in a very constrained space3) the possibility for problems to occur. 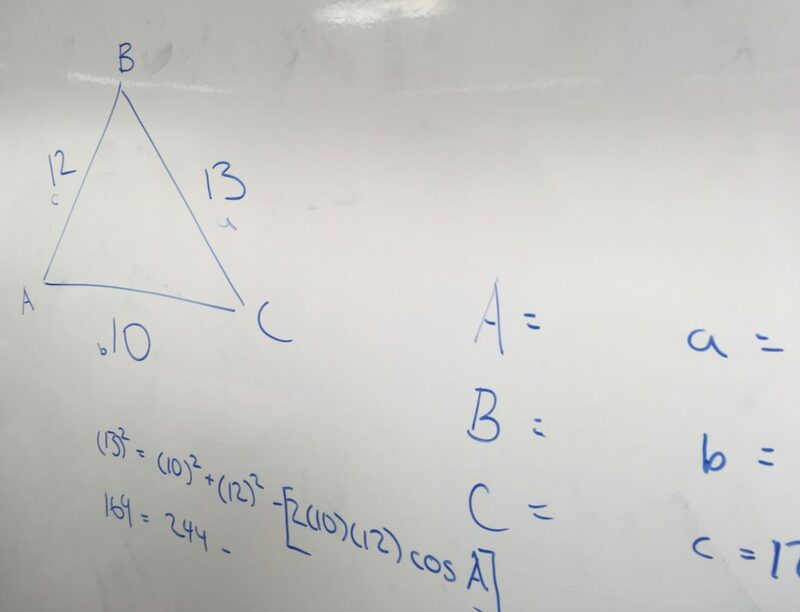 Create a triangle where a solver would need to use the Cosine Law (at least once) to solve the triangle. Create a triangle where a solver would need to use the Sine Law (at least once) to solve the triangle. Create a triangle where an unknown side length turns out to be 13 units long. The first two tasks provided plenty of information on the groups’ understanding of the Sine and Cosine Laws. 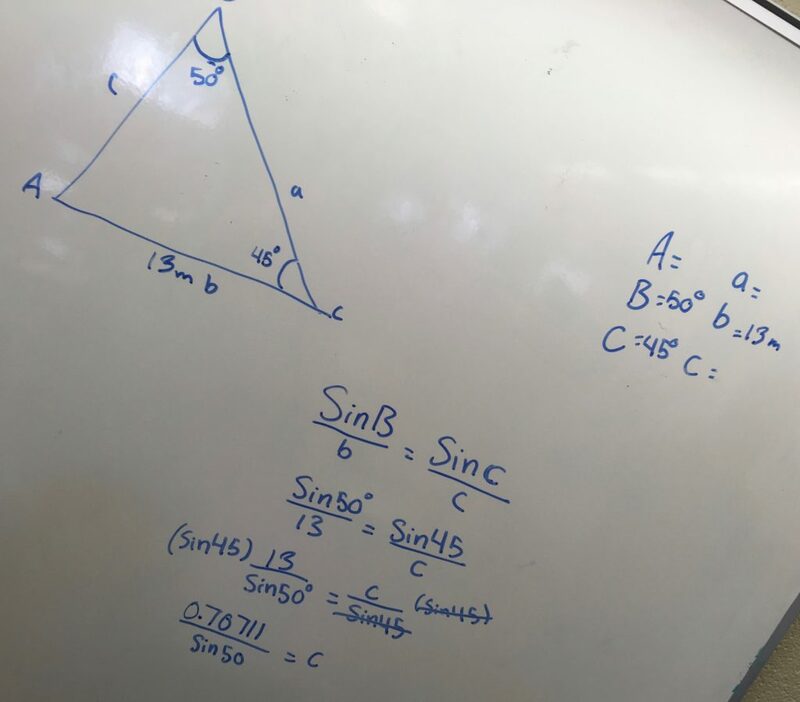 Students were much more comfortable using the Cosine Law to solve for a side length as opposed to an angle measurement, and when asked to work with the Sine Law, many ascribed values to two angles and the enclosed side. I highlighted any deviance from these predominant patterns as we worked. For example, some groups included obtuse angles in their given information or chose to give the values of all three sides and use the Cosine Law three times to find the three angles. By the time all the groups were done with the first two tasks, I had ample opportunity to observe grade level competency. Much to my (expertly concealed) delight, the first problematic triangle was built in response to the second task. This was the moment I was waiting for. I called for the attention of the class, and had the group explain their dilemma. We then had each group copy the same triangle but change the length of the side marked “8”. Each of the ten groups was assigned a new value: 2, 4, 6, 10, 12, 14, … , 22. Each group calculated the measure of Angle B, and we discussed why some values existed and others did not. The group eventually narrowed down a cut-off point (their verbiage). It was an organic encounter with the impossible; one that I put on hold for the time being to address the other tasks, but promised to take up the next day when we were slated to work with the ambiguous case. Students encountered the third task exactly as I expected: complete bewilderment. What a crazy thing to do? Not only did I just allow them to create a triangle (for the first time in their mathematical history), I was now asking them to target a specific value! I am immensely proud that none of the groups entered into a guessing game. They all patiently approached the problem and the results were amazingly surprising. One group set up an equilateral triangle with a pair of 60° angles and a single side length of 13. Another group set up an isosceles triangle with two base angles of 70° and a leg with a length of 13. One group set up a right-angled triangle and was reverse engineering 13 units with primary trigonometry. After we revelled in the brilliance, I outlawed equilateral triangles, isosceles triangles, and right-angled triangles. Providing this constraint encouraged students to look to the Sine Law and Cosine Law for solutions. As the ideas pollinated the classroom, the industry standard became to include a side of 13 units and then solve for an unknown. That unknown was then swapped out with the side length of 13 units, leaving the (unsuspecting) solver to always uncover it’s predetermined length. Students “solve and swap” for Angle A using the Cosine Law. Students “solve & swap” for Side c using the Sine Law. Two more unanticipated problems emerged during the third task. The first was a group that attempted to assign values to two angles and two sides of their triangle. They called me over because they were confused that, even though they decreed that the side length would be 13 units (as evidenced by the label placed next to it), the Sine Law was getting a different solution. This sponsored a great discussion about how much freedom you have with triangles. Can we decree two attributes? three? four? I almost did not catch the second unanticipated problem because they started erasing their board just as I was finishing with another group. I was able to take a picture of the work that remained. They explained that they were erasing because they “did the Cosine Law wrong,” but the values they chose were doomed from the start. 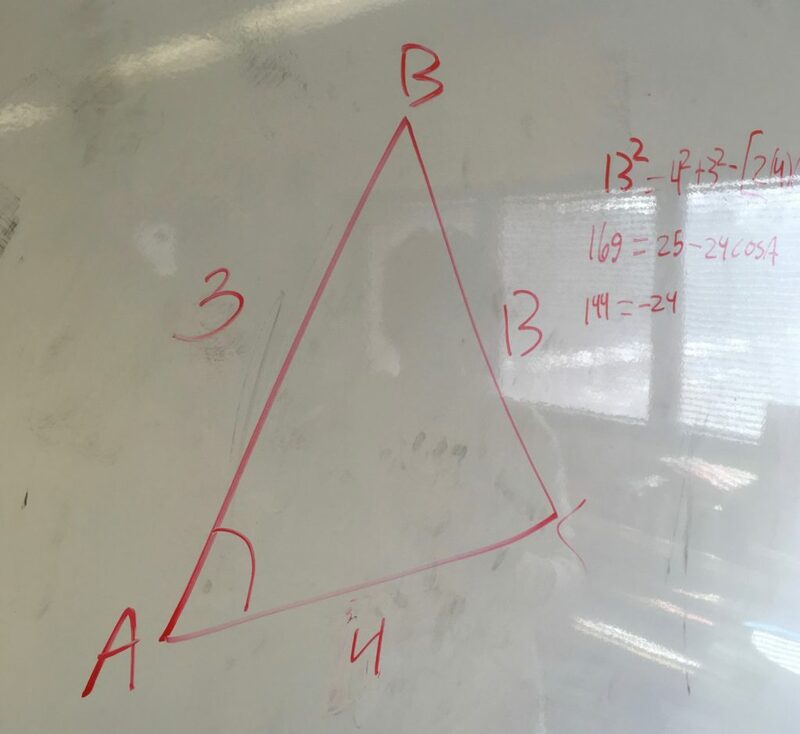 What was left of the group’s triangle and the Cosine Law to solve for Angle A. Their chosen side lengths did not satisfy the triangle inequality. Predictably, this does not appear in the secondary curriculum–one that is shallow in geometry and filled with pre-manufactured (and well-behaved) triangles. It did, however, serve an interesting conversation starter. Stop thinking that great problems are crafted exclusively by masters. Try infusing some ambiguity or switching what a student is actually asked to do. (e.g., instead of solve, create). When I talk about students organically encountering ideas or problems with ideas, I am not campaigning against practicing skills. I’m advocating that practice be nested in conceptual intrigue. (Just look at how many opportunities students had to work with the Sine Law and Cosine Law). Discovery is not random. As teachers, we create sets of conditions that we predict might result in specific topics/ideas/actions becoming relevant. Teaching is the act of observing student thinking and playing with the constraints in order to trigger further action. In this case, I created the conditions for several potential problems with triangles to emerge, but the students did all the heavy lifting. It is both surprising and hilarious that the top Google hit on “SYR CXR TYX” (at least for me) is Urban Dictionary. I also believe teachers should be careful to not send the message that all other/older methods are obsolete. They become options–ways knowers can remain coherent in a problem scenario. I’ve written a little bit on the actions of the student and the role of the teacher if we think of learning as maintaining coherence within a constrained environment.